The Accretionary Wedge of March is asking for your "favourite geologic picture" and is hosted by Ann's Musings. In a first moment I couldn't decide what image to take, the classic outcrop or the marvellous landscape? - but there is an elder picture of 2007 I really like, at a first glimpse it's geological context is not obvious, but this is also a reason that I like this particular picture. 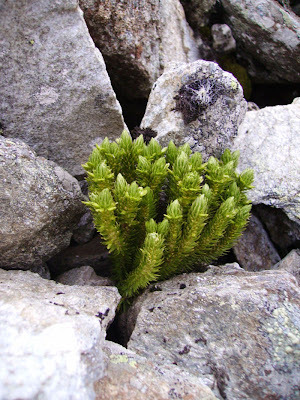 The photo shows a species of club moss emerging from a pile of rubble. The club moss Huperzia selago is one of the two species of this genus present in the Alps; this species in particular can be found in high altitude and in glacier forelands, acting as pioneer species. This specimen was emerging from gneiss and schist debris covering an active rock glacier; I like the contrast of the green plant to the cold grey of the rocks forming a sort of picture frame, the impression that the club moss overcomes every obstacle, even "breaks" the rocks apart to emerge from the underground. For plants creeping debris and permafrost represent an ulterior challenge for colonization and growth in an already nasty environment, with long snow cover, low temperatures and deadly UV-radiation. I think the picture depicts well the struggle of existence in a harsh environment - but as the the rocks act as obstacle they at the same time also provide shelter, moisture and nutrients. For the geologist also the recognition of even the smallest clue can be helpful, I find it fascinating how many different methods can be adopted to understand the development of a geomorphologic feature or a landscape - in combination with classic geological methods for example the vegetation cover or diversity can give indications of the recent activity of rock glaciers, or help to reconstruct the temporal development when other indicators are absent. "Earth history can be described as a permanent interaction between the geosphere (lithos) and life processes (bios). To investigate these processes is the mission of Lithobiontics, a new research discipline between Geology and Biology." Thank you David for your picture for the Accretionary Wedge #32. It definitely adds some color. I like the way you explain about the club moss. You are so right at how you have to look at all the clues to figure out what has happened.